Waterproofing Cracked Basement Floors In Northern Virginia is Fairfax Contractors specilty. But the big question is how to stop water from entering from your concrete basement slab. There are three main reasons your concrete basement slab is leaking. Fairfax Contractor can solve all types of waterproofing caused by a cracked basement floor. 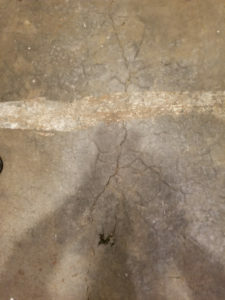 One reason your basement slab is flooding your basement is you have a major crack in the concrete that is allowing water to pass through this crack. The second reason waterproofing problems are present in your basement slab is the condition of the concrete. The third problem is your Nothern Virginia home is located in a flood zone and the hydrostatic water is leaching into your basement slab. For more information on how to waterproof your Northern Virginia basement click this link. 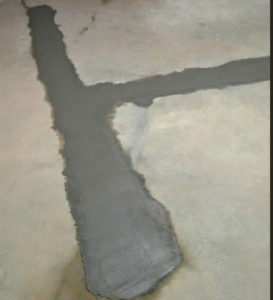 Fixing a major crack in your basement is easily fixed with an epoxy injection. When are expert foundation estimators find the crack that is causing your flooding basement slab we will propose a solution involving sealing the crack with epoxy injection. An epoxy injection will stop water from leaking into your Northern Virginia nomes basement slab. This process will stop water seepage once and for all. The truth is your problem maybe not one single crack but spider cracks that are allowing water in infiltrating your basement floor. For more information on epoxy, injection click this link. Leaks in your basement floors are a common problem in Northern Virginia homes. Leaks in the concrete basement floor can cause very serious damage. As contractors, we can quickly fix this problem when this problem is detected. Moisture from these concrete floors can ruin carpets and also cause the growth of mold. 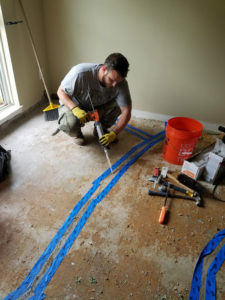 Fairfax contractor follows some options to repair basement floor leaks: First we will seal the basement cracks with epoxies or hydraulic cement. The next step is to seal the floors of your basement with a product such as SEAL-KRETE® DampLock Basement and foundation waterproofing paint which can fix your basement floors and keeps out water. DampLock paint can withstand up to 15 psi of hydrostatic pressure in your basement floor. SEAL-KRETE meets the ASTM standard for below-grade waterproofing of leaking basement floors. You may have under lying problems in the concrete in your basement slab that are causing your basement to flood. If you are experiencing damp carpet after heavy rain in your Northern Virginia home you may have a concrete slab problem. Concrete that was poured when your home was built may have flaws. These flaws may because there was no vapor barrier installed, or the concrete was poured in freezing conditions. Correctly poured concrete floors should include a gravel base, plastic vapor barrier, and be at least 4” thick. If the contractors did not follow the existing building codes when your home was built you may be experiencing spider cracking of your VA basement floor. Spider cracks can cause water to infiltrate through the concrete in your basement floor. The big question is how to fix spider cracks that cause your carpet in your basement to become wet. Fairfax Contractor uses a verity of methods to correct this basement waterproofing problem. One of the methods we utilize is a lateral French drainage system that will reduce the hydrostatic pressure below your concrete slab. A lateral French drainage system is a channel that is cut though your basement slab that will reduce the hydrostatic pressure and divert it to a sump pump.